Ducasse is a 3-Michelin star french restaurant in the Dorchester Hotel in London. It has seen a somewhat meteoric rise through the ranks from the time when it was first opened in end 2007 and was panned by critics (relatively speaking) to 2010 when it justifiably received its third star. We are lucky to have been able to dine here several times, and first ate here when it just opened (5 days after opening), when it had its second star and most recently, last month. 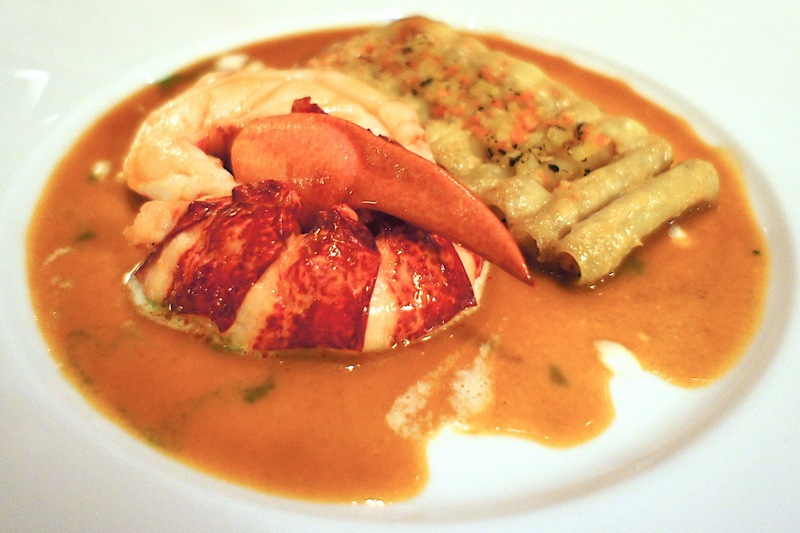 Eating at Ducasse is always a bit of an event. It means walking into the Dorchester hotel (which is itself an institution) and through its lobby typically filled with very opulent guests (we never fail to feel a bit underdressed in this hotel). The restaurant is at the far end of the hotel, and to get to it, we'd have to pass through the hotel lobby cafe, walking into the mist of cigar smoke and amongst oil sheikhs, indian industrialists and chinese tycoons (and their equally well-anointed spouses and offspring). The restaurant does not have a bar area, and its reception is situated outside the restaurant at the hotel lobby cafe, hence we usually have to endure the scrutiny of the above-mentioned sheikhs, industrialists and tycoons while standing idly around waiting for our table. The restaurant itself feels quite spacious, the ceilings are high and the dining areas are split between the main area in the heart of the restaurant, as well as an elevated corridor which can be partitioned into small private dining rooms (with views of Hyde Park if you stand up). Sitting at the corridor feels brighter (the lighting here is better) and more private but dining in the main dining area is a grander experience. When we took our seats, we were served with a glass each of the house champagne and their customary cheese puffs (the photo of which forms our blog banner), which was very addictive and on which we gorged (we ate about 2 bowls of it that night). The title of our blog came about from our previous trip to Ducasse when the waitress tried taking away our cheese puffs while we were still eating it, to our dismay. Fortunately, the eagle-eyed head waiter spotted it and very apologetically replaced it with a freshly baked bowl of cheese puffs. We were started off with a tomato amuse-bouche in an interesting egg-shaped bowl (not sure what it was, it was like tomato puree with tomato foam). It was quite average and we weren't too impressed (my sister's was way to salty - as if they dropped a lump of salt into it - the waiter offered to replace it but we declined as there was a lot more food to be eaten over the course of dinner). We were looking for a bottle of Burgundy to go with dinner and the sommelier recommended a 2003 Gervrey Chambertin from Denis Mortet (bizarrely in the space of a week, we had the D. Mortet three times, one other time also on the recommendation of the sommelier in Ledoyen, and the third time, I found it in the wine list in Pied a Terre and had to order it). This bottle turned out to be absolutely fantastic, it was drinking well and had a complex, chocolaty flavour and a long elegant finish. The three of us opted for the a la carte menu, with my sister and my wife going for three courses and myself, four. 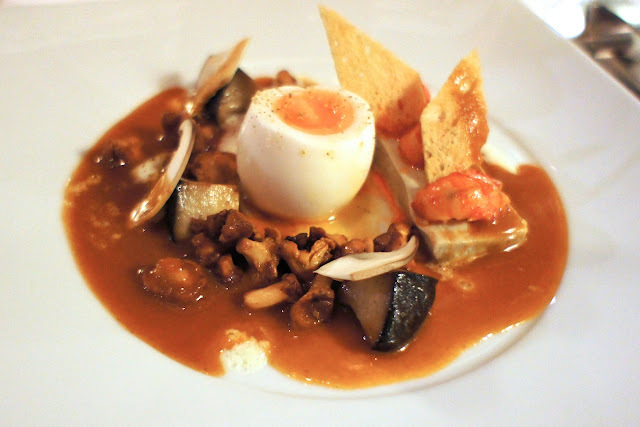 We all started off with the soft-boiled organic egg, crayfish and wild mushroom with natua sauce. This was a superb dish; the natua sauce (it was like a crayfish/lobster bisque but more concentrated) was rich and tasty, and the hard-broiled egg white and runny yolk complemented the assorted mushrooms very well. 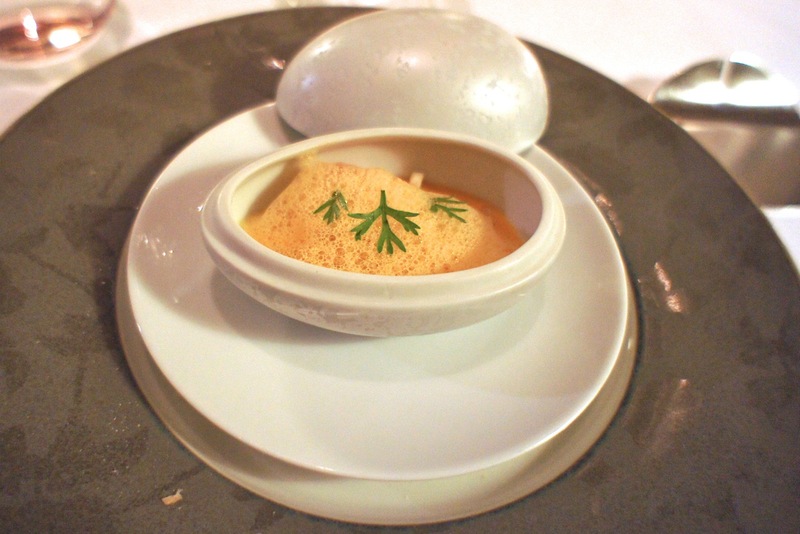 Our rule of thumb is to always order the egg dish when in a french restaurant, and once again it did not disappoint. 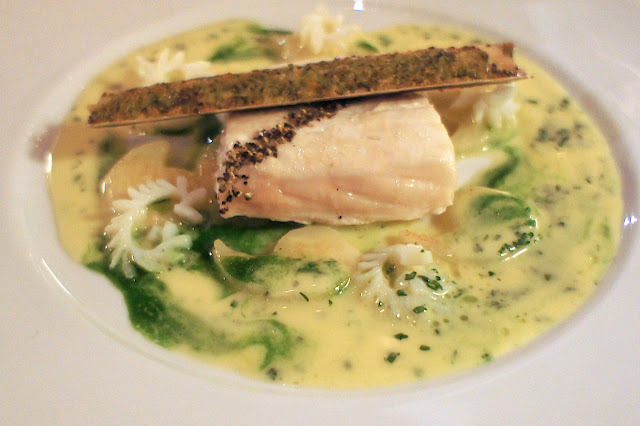 My second dish was the fish main course; the wild sea bass, razor clams with parsley shellfish jus. This was another excellent dish. The seabass was cooked to perfection as it was juicy and tender. The creamy parsley shellfish jus was a great sauce with the fish, but the razor clams were a bit salty and garlicy for my liking. Nonetheless, it was a very good dish. As this was my additional course, the ladies had to sit it out and feed on the cheese puffs instead. For the main course, my wife opted for the roasted native lobster, seasonal vegetables and macaroni au gratin. For her, this was the best lobster she had ever eaten. It was very sweet and juicy and its flesh was firm and fresh. The macaroni au gratin was quite ordinary though. My sis and I had the farmhouse veal loin from Limousin, tender potatoes and choron (a kind of sauce) condiment. I had read about this in other blogs of this restaurant, and the Limousin veal was quite raved about. Unfortunately, though it was good, the veal did not live up to my high expectations. I found it quite tough and a tad bit overcooked for my liking. It was not particularly tender nor tasty. 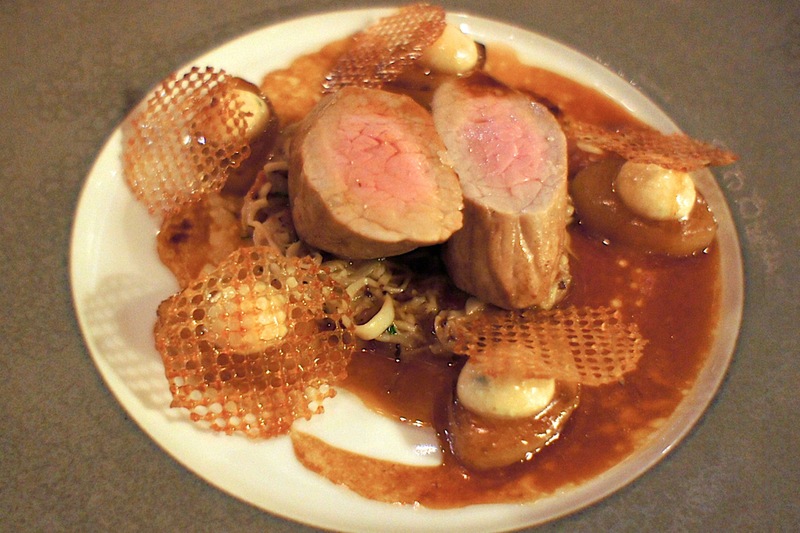 Personally, we feel that the red meat dishes at Ducasse tend to be quite heavy. We had the beef fillet on our last visit and it was also a bit tough and hard to finish. We'd stick to the fish and seafood main courses (which are excellent) on our next visits. 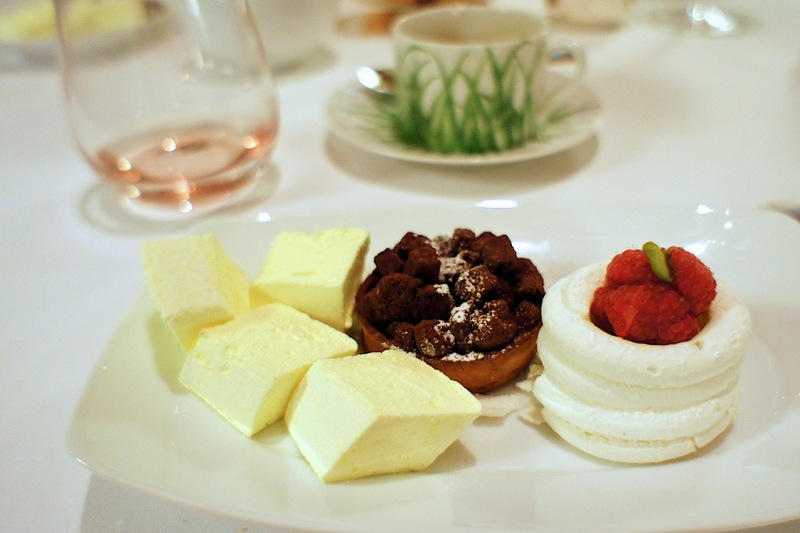 Desserts are quite an event at Ducasse. 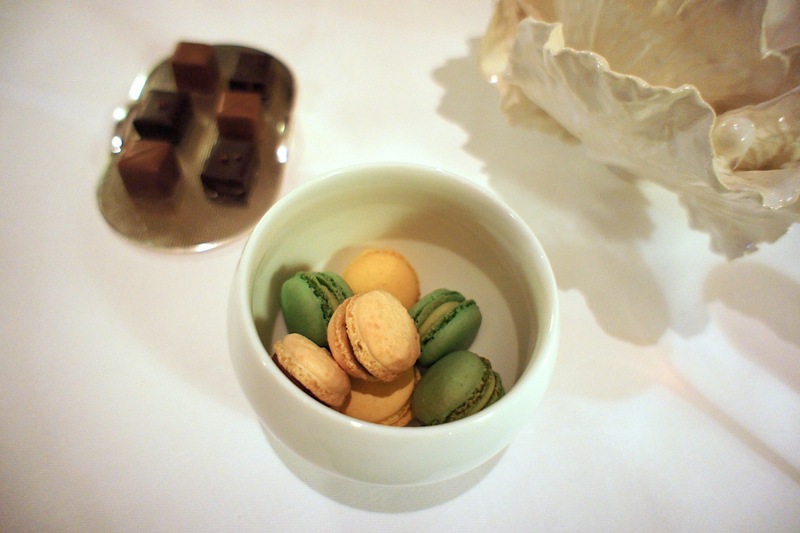 Petit fours appeared very quickly on our table (chocolates and macaroons) while we were waiting for our dessert. 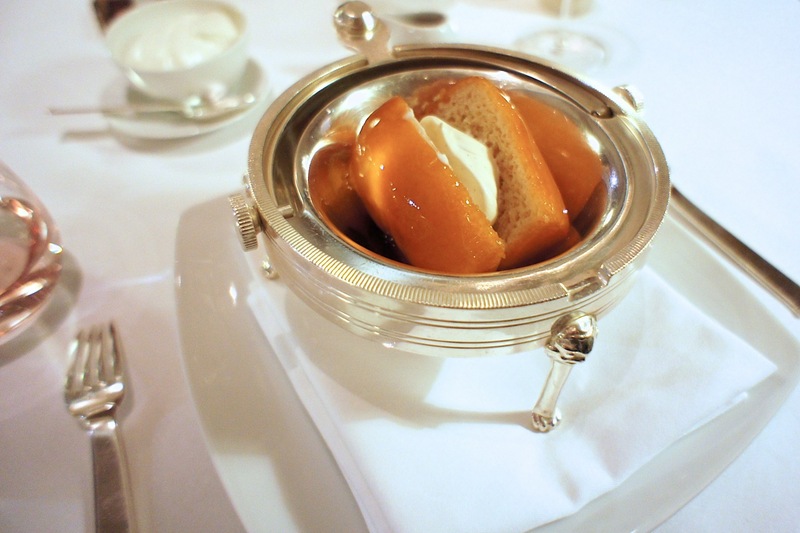 We had all ordered the Baba like in Monte Carlo, which was a dessert I was still dreaming off since my last visit here. At first glance, this was a very simple and unremarkable dessert; a cold sponge cake with rum poured over it (and a dollop of rich cream). However, we've tried it in other restaurants (one of them being the now defunct Foliage at the Mandarin Oriental) and none came close to the Ducasse one. Somehow, the sponge cake was of a constitution which kept its shape and texture despite being drenched in liquid, and absorbed the rum consistently throughout (such that it did not resemble a soggy cake sitting in a pool of fluid). The waiter came around and offered a choice of rum from 3 bottles; on his recommendation, we went with the spicy one (can't remember which one it was now). It was as good as I remembered it from the previous visit. It was 1am by this time, and we had eaten to the brim. However, it was by no means the end of the dinner. We had our coffee and tea and the waiter pushed out the trolley of sweets, which had all manner of tarts, pastries, sweets, chocolate and marshmallows, just in case we weren't full yet (I cannot imagine this happening a lot at this restaurant - people still not full but this juncture). My sis had a friend who came to this restaurant recently and did not dare to pick from the trolley as she thought that these were individually charged. My sis was determined not to make the same mistake and wanted to try everything in the trolley (and nearly succeeded). We stumbled out of the restaurant at nearly 2am and while waiting for a taxi at the hotel lobby, could only fantasize that one of the half-dozen Rolls and Bentleys on the driveway be there to take us back to the hotel. Final Thoughts: An excellent meal and superb restaurant, with an elegant interior and flawless service. The appetizer, fish and desserts were excellent, though for the second time in a row I was slightly disappointed by the red meat course (I had the beef fillet last time) which I felt was heavy and a bit overcooked. 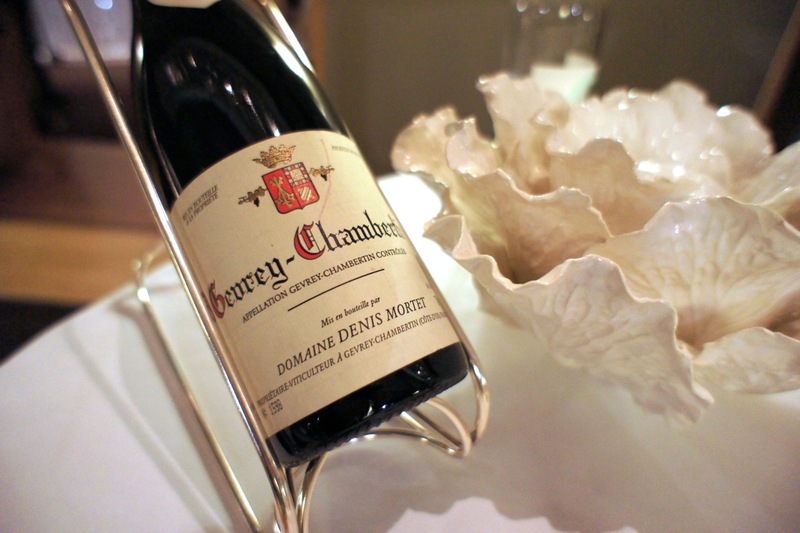 The wine list was extensive and the sommelier did well in recommending the D. Mortet Gevrey-Chambertin which was an excellent choice. A very enjoyable dining experience (if one were in the mood to dress up and go somewhere fancy). Thanks, we always have a good time there and will certainly dine there again. They have the layout for a long table in a private dining area which could work for your event..